Nebuchadnezzar praised and worshipped the Most High God. When his reign came to an end he was succeeded by three kings in quick succession. The last of these three was Nabonidus. Nabonidus spent considerable time away from Babylon and when he was gone his son Belshazzar reigned in his place as the “acting King.” Finally, Nabonidus was met by Darius on the battlefield, bottled in, and remained helpless while Darius’ troops marched on Babylon to conquer it. 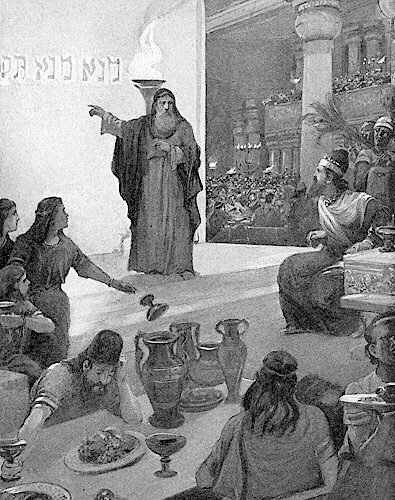 Belshazzar had no idea what was about to happen. He believed he was safe. So safe that he threw a party. He invited thousands of people to attend and it was a grand party indeed. Singing, dancing, drinking, carousing with wives, concubines, and slaves. He took pride in his ability to party in fact and thought that in order to be funny, or to be rebellious, he and his guests should drink their wine from the vessels taken by Nebuchanezzar from the Temple in Jerusalem. As they reveled in sin and worshipped their false gods they took steps to blaspheme the Most High God, until in the midst of the celebration a hand appeared and wrote on the wall! Proud and drunk as he was, this shook Belshazzar to the point that he turned pale and his knees knocked together. He immediately called for the wise men and magicians to tell him what this meant. Nebuchadnezzar had learned not to depend on his “wise” men. He had learned to trust Daniel. He had learned that God is sovereign and that He sets kings up and takes them down. Belshazzar did not share this perspective. We learn from history only that we are destined to repeat it. Finally the queen (we do not know if this was a wife or his mother) reminded him about Daniel. A man “in whom is the Spirit of God.” She knew Daniel. She knew his testimony and his history with Nebuchadnezzar. She told Belshazzar that he needed to talk to Daniel if he wanted answers. Belshazzar called Daniel and offered him what he had offered his wise men. If he could tell him what the writing meant he would be given a royal robe, a gold chain, and made third in the kingdom (after his father, Nabonidus the king, and himself as acting king). Daniel wanted nothing to do with the gifts he was offered. He boldly preached to Belshazzar, telling him that even though he knew the truth about Nebuchadnezzar and the Most High God, he chose to worship idols and mock God. Instead of being humbled by the truth, Belshazzar believed he was immune to it. Daniel interpreted the writing, telling the meaning of the words, and explaining how they would be fulfilled that very night. Belshazzar had been weighed and found wanting, that is, for all that he knew, for all the truth he had been taught, he was not faithful, obedient, or humble before God. And as a result the kingdom would be taken from him. Just as Isaiah prophesied (Isaiah 47:10-11), and just as Nebuchadnezzar had dreamed, Babylon was about to fall. 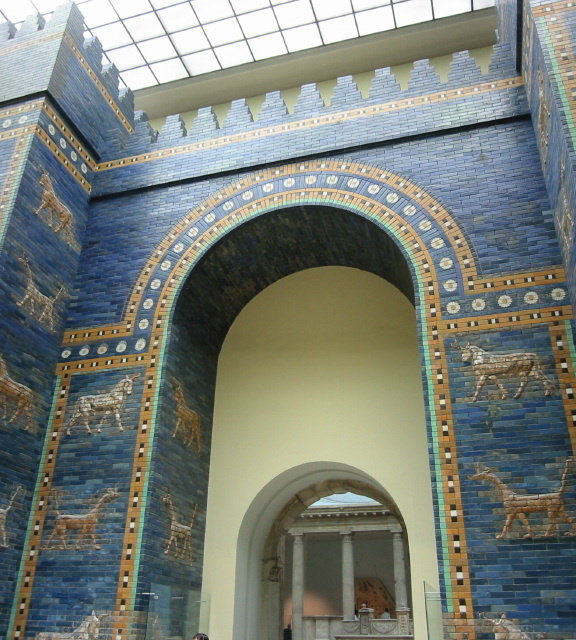 Darius, leading the Medes and Persians marched on the impenetrable city, avoided the guards, and in a daring sneak attack interrupted Belshazzar’s party and killed him. Babylon the great had fallen, just as God said. The kingdom represented by God in Nebuchadnezzar’s dream, the kingdom of silver, had toppled the head of gold. Just as the man who would gain the world but lose his soul, Babylon fell, and Belshazzar’s life and reign came to a quick end. Lessons about about godliness, a good testimony, the surety that our sins will find us out if not covered by the blood of Christ, and the truth that knowing the truth is not enough, we have to believe it and obey it. Ultimately, Belshazzar knew the truth about his predecessor Nebuchadnezzar, but he did not believe that the same would happen to him. He believed he was greater than God and immune to judgment. He was wrong. He partied like there was no tomorrow, and for him, there wasn’t. What can we learn from this short chapter? Find out Sunday at 10:30 as we meet for worship and continue on in our series from Daniel in this message from Daniel chapter 5 titled “Divided by Darius.” We hope to see you there. « Are You Out of Your Mind?